tribution. Cleanly, in the sense of changing as little as possible the system’s configuration-files and scripts. and gave me a good start (especially for wpa_supplicant.conf, which I won’t detail here) . However, the original content of the config-files mentioned there, wasn’t matching with what I found on my installation. Maybe it is because Jessie is still quite new as of writing this. Starting with the /etc/network/interfaces-file. It mentions eth0 (the wired ethernet port) and two wlan-devices and it says they are all configured manual. Manual in this context means that the ifplugd takes over the network configuration. Ifplugd detects a physical connection and launches a dhcp-client to complete the interface-configuration. As of writing this, it does not properly take care of wlan-devices, however this it is how ifplugd is configured (from /etc/default/ifplugd). My RPI2 will be used mainly via WiFi, but for debugging reasons I might plug the wire. Hence I’d like the system to always (try to) configure the WiFi-device and optionally the wired if a cable is plugged. To achieve this, here is what I did. This does exactly what I want with very few changes to the system’s files, thus clean. I just did an apt-get update of my jessie installation and noticed that upstream has changed the interface-file. It now contains the allow-hotplug-lines I added to my interfaces. However, this does not change anything regarded the problematic I had on my system. ← A tableau by “Jean Eve” or is it not? SSIDs are well displayed and I’m abble to select one of them and key my password in, but RPi never connect, even with the conf you mentionned. So I tryed Wheezy and that’s just a little better as the wifi logo is now displayed, and I am probably connected, but not with an automatic local IP my routers DHCP should give me. Usually i’ve got something like 192.168… and here RPi has 169…. ? If the RPi gets an 169.x.x.x address it means it has not discovered a DHCP-server (the one who assigns IP-addresses in an IP-network). 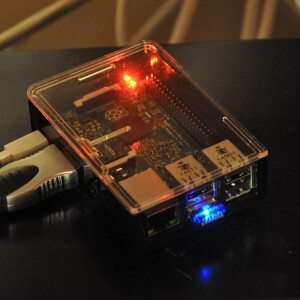 I assume that when you connect the RPi via an Ethernet cable in the same network and other WiFi-devices are working well. So most likely, even though the RPi could connect to the WiFi using Wheezy it wasn’t able to communicate with other devices. Have you checked the log-files? In /var/log/syslog or by running dmesg? Maybe there are some messages giving you some clues. Have you tried your Edimax adapter on a Laptop or a PC? Try to make sure that it works. What do you use as power supply? Maybe the RPi is not able to power correctly your USB-devices and thus gives this strange behaviour?